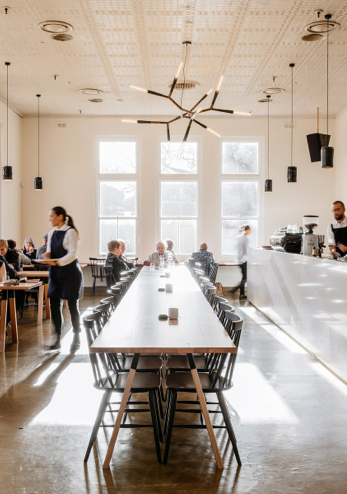 The Eatery’s main dining room is called “The Phasmida Room” and is named after the two “Phasmida” lights centred in the middle of the room which were handmade for us by Melbourne artist, Christopher Boots. “The Phasmida Room” boasts many original features including the 15-foot pressed metal ceiling, linoleum floor and is surrounded by large sash windows, which flood the room with natural light. It also features a large fireplace by “Les Cheminées Philippes” as a focal point. 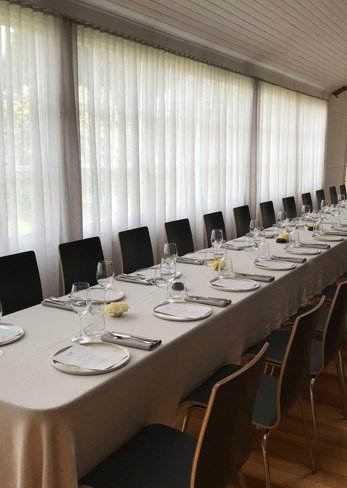 To book “The Phasmida Room” for your private lunch or dinner event, please contact us directly via email or call us on (03) 6262 0011. As the name suggests, a long narrow room comprising of original Yorkshire sliding sash windows looking out onto our herb garden and lawn area. This room is flooded with natural light and full-length sheer curtains. Contact us via email or call us on (03) 6262 0011 for more information on holding your next event with us.